A portion of a sandwich. The definition of a portion is part of something. An example of portion is half of a sandwich. Portion is defined as to divide into parts. 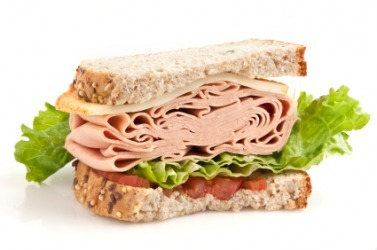 An example of to portion is cutting a sandwich in half. "portion." YourDictionary, n.d. Web. 09 April 2019. <https://www.yourdictionary.com/portion>. A section or quantity within a larger thing; a part of a whole. A part separated from a whole. c. A woman's dowry: marriage portion. A person's lot or fate. To divide into parts or shares for distribution; parcel. To provide with a share, inheritance, or dowry. Middle English from Old French from Latin portiō portiōn-; see perə-2 in Indo-European roots. Relatively formal, compared to the more informal part or more concrete and casual piece. For example, “part of the money" (both informal) but “portion of the proceeds" (both formal). To divide into amounts, as for allocation to specific purposes. To endow with a portion or inheritance. Him portioned maids, apprenticed orphans, blest. "” Alexander Pope. Particularly used as portion out. Relatively formal, compared to the more informal divide, divide up, or the casual divvy, divvy up. From Middle English porcioun, from Old French porcion, from Latin portio (“a share, part, portion, relation, proportion"), akin to pars (“part"); see part. Compare proportion.